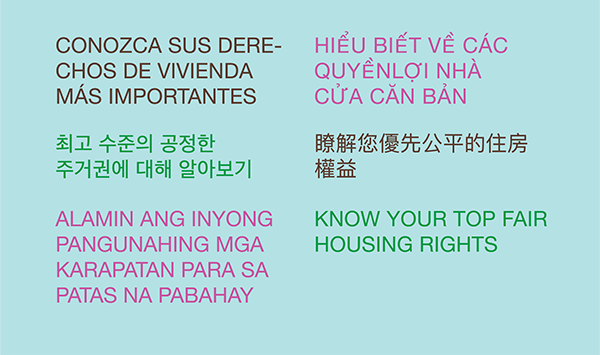 The UCLA Labor Center and California’s Department of Fair Employment and Housing (DFEH) collaborated to produce Know Your Top Fair Housing Rights, a multilingual booklet addressing a critical need in California for culturally sensitive fair housing resources. Given that Asian and Latino communities comprise 53% of the state’s population, the booklet offers educational materials in the most commonly spoken languages (in addition to English): Chinese, Korean, Spanish, Tagalog, and Vietnamese. The booklet explains housing rights and protections in California and the mission of the DFEH. It highlights prohibitions against discrimination, harassment, and retaliation, as well as examples of common fair housing law violations. It encourages those who have experienced inequities to call, visit, or submit a complaint form online to the DFEH. The right to equal treatment regardless of the source of your income. The right to housing with your kids. The right to roommates if you have room. The right to use your preferred language. The right to your assistance animal. The right to access housing regardless of disability. The right to withhold your immigration status. The right to housing without harassment.